For the Bank of England, the fact that UK wage growth is now the highest since the end of 2008 –3.2% excluding bonuses – will be the key takeaway from today’s jobs report. Momentum has really picked up over recent months, and reinforces the idea that firms are having to pay increasingly high premiums to retain and attract talent. As we noted in our preview, skill shortages are now most acute in the hospitality, construction & IT sectors. 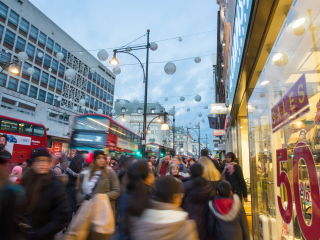 Given that the UK is a predominantly service-based economy – and a large chunk of service-sector firms’ cost base is wages – the Bank expects this to translate into higher consumer prices in the medium-term, as companies look to protect margins. Admittedly, we suspect the current level of wage growth represents something of a peak but we expect the underlying trend to stay with us as we move into 2019. So in any other situation, we suspect the Bank of England would be looking to hike rates again fairly soon. But as ever, Brexit is the number one consideration, and there is some tentative evidence on the employment side of the jobs report that this is starting to cause problems. Admittedly, having ground to a complete halt over the summer, we did see a marginal rebound in hiring in the latest numbers (23,000 in September). 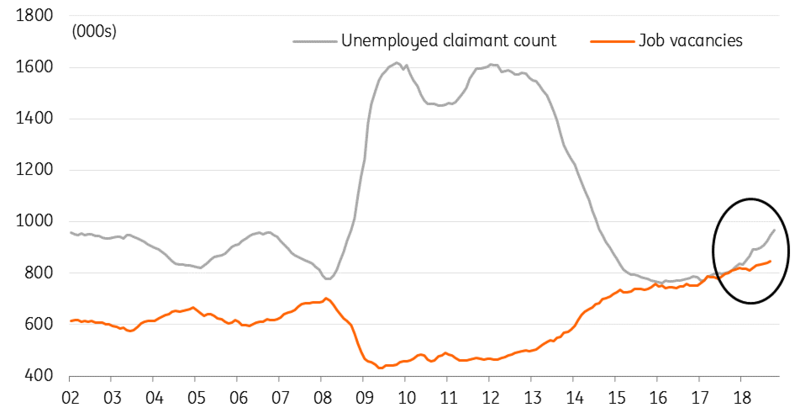 But the unemployed claimant count shows that a rise over the past few months appears to be gaining further traction and importantly, is starting to diverge away from the number of job vacancies (see chart below). 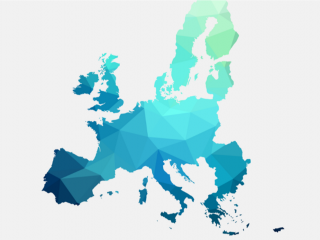 Given the mounting uncertainty surrounding Brexit – in particular, whether Parliament will ultimately approve any deal Theresa May agrees – there is a risk we won’t know for sure that ‘no deal’ has been avoided until the New Year. At the very least, this means that firms are likely to take a more precautionary stance to hiring and investment as they increasingly look to instigate contingency plans. We therefore think the recent trend in employment is likely to persist in the short-term, and we are likely to see the economy as a whole lose steam over the winter. For that reason, we don’t expect a Bank of England rate hike until May 2019 at the earliest.